www.collegebookart.org: "Founded in 2008, the College Book Art Association supports and promotes academic book arts education by fostering the development of its practice, teaching, scholarship and criticism." CBAA, 2016. Edition of 50 (24 available for sale). Printed pieces: 9 x 12". 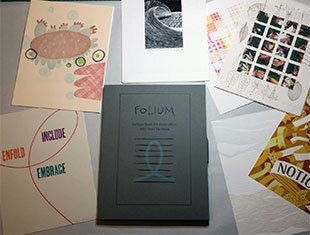 Flat prints, broadsides, and folios on a variety of papers using any print medium or combination of media, including letterpress, offset, digital printing, and/or other printmaking techniques. Housed in custom enclosure (10 x 13). CBAA: "CBAA’s first print portfolio/exchange to benefit the CBAA academic journal, Openings: Studies in Book Art. This peer-reviewed journal aims to energize artistic practice, stimulate study in the field of book art, and encourage profound and multifaceted thinking in this dynamic arena. By providing open online access to Openings, CBAA seeks to support diverse conversations and an ongoing examination of the continually shifting role of the book in contemporary culture. 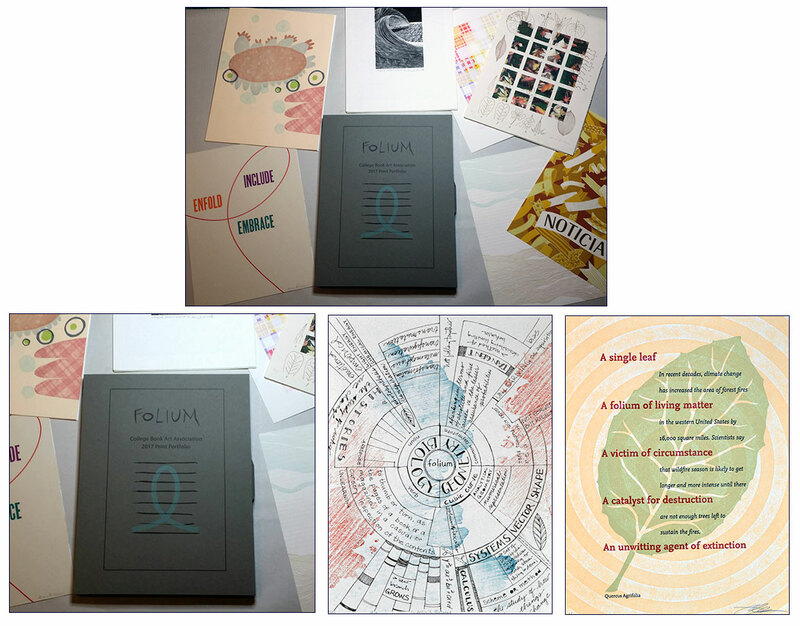 "Inspired by the potential for Openings to grow as a platform for critical and theoretical investigation, the theme for this portfolio is folium (plural foliums or folia). Folium, in Latin, means leaf: a leaf of a book or a tree. The mathematical folium of Descartes is a curve consisting of two infinite branches sharing a common asymptote; the curve has a double point and a leaf-shaped loop. In anatomy, a folium is a wrinkle on the surface of the brain. In geology, a folium is a thin, leaflike layer or stratum occurring especially in metamorphic rock. Together these definitions suggest growth and layers, and they lead to a visually rich collection of prints: prints with references to math, leaves, folded paper, and suggestions of the infinite. "The imaginative variety of prints and folios in the Folium collection range from classic letterpress printed broadsides with text to purely visual interpretations of the theme to contemporary pieces utilizing tactile materials and inventive techniques. The imagery includes leaves and algebraic curves, as well as references to book pages and the brain. The participating artists are professionals in the field of book arts: printers, binders, educators, and fine artists. In the spirit of our journal, Openings, this portfolio is our offering to the future of book arts. Participating Artists: Megan Adie; Tia Blassingame; Mare Blocker & Jessica Spring; Denise Bookwalter; Macy Chadwick; Julie Chen; Bridget Elmer; Lucy Holtsnider; Andrea Kohashi; Sara Langworthy; Susan Lowdermilk; Amy Lund; Kimberly Maher; Emily Martin; Kerry McAleer-Keeler; Allison Leialoha Milham; Kathleen O’Connell; Candida Pagan; Radha Pandey; Camden M. Richards; Jaime Lynn Shafer; Barbara Tetenbaum; Emily Tipps; Sara White; and, Karen Zimmermann.